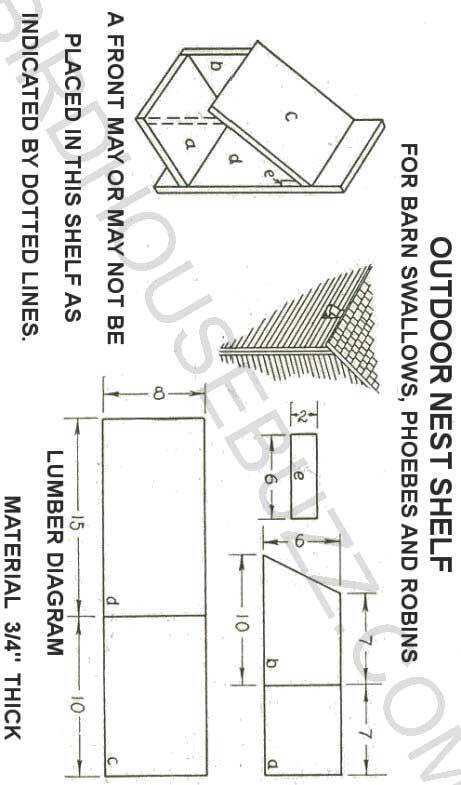 Free plans to build an outdoor nest shelf for robins, barn swallows or phoebes. Robins, phoebes and barn swallows all like living life on the edge. 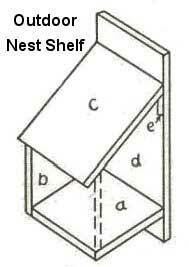 That's why building a nesting shelf is a perfect alternative to keep these birds from locating their nests in the eaves of your patio roof, gazebo or other inconvenient locations. Mourning doves, cardinals and blue jays also will nest on a ledge, so you're likely to have an interesting mix of feathered friends stopping in for the nesting season. Building these simple nesting shelves allows you to position them where you can enjoy watching their antics, and keep them away from areas that may have too much foot traffic. Different species prefer different heights, so check how high you should mount your nesting shelf to attract a specific type of bird. When an outdoor nesting shelf is built, the three most common birds that use the shelf as the base of their home are Barn Swallows, Phoebes and Robins. Robins usually announce the coming of spring when they return to their breeding grounds in the northern states, where they are general favorites. The nest is usually built of mud and lined with grasses; placed in the fork of a tree or on some sheltered ledge. Robins take kindly to nesting shelves put up for them and it is well to put up several since but one brood is reared in each nest built. This old nest should be removed after the young birds have gone. By providing the nest shelf you can observe these birds and watch them as they raise a family in a location that will keep them safe and sheltered.